Initially developed by B&R, POWERLINK was introduced in 2001. The Ethernet POWERLINK Standardization Group (EPSG), an independent user organization with a democratic charter, has taken charge of the further development of the technology since 2003. POWERLINK is a completely patent-free, vendor-independent and purely software-based communication system that delivers hard real-time performance. An open source version has also been made available free of charge in 2008. 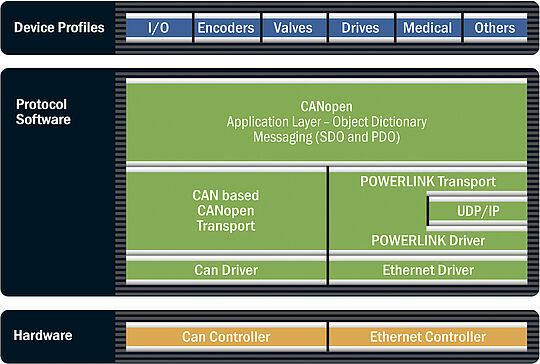 POWERLINK integrates the entire range of CANopen mechanisms and fully complies with the IEEE 802.3 Ethernet standard, i.e. the protocol provides all standard Ethernet features including cross-traffic and hot plugging capability, and allows for deploying any network topology of choice. POWERLINK uses a mixture of timeslot and polling procedures to achieve isochronous data transfer. In order to ensure co-ordination, a PLC or an Industrial PC is designated to be the so-called Managing Node (MN). This manager enforces the cycle timing that serves to synchronize all devices and controls cyclical data communication. All other devices operate as Controlled Nodes (CN). In the course of one clock cycle, the MN sends so-called “Poll Requests” to one CN after another in a fixed sequence. Every CN replies immediately to this request with a “Poll Response” on which all other nodes can listen in. A POWERLINK cycle consists of three periods. During the “Start Period,” the MN sends a “Start of Cycle” (SoC) frame to all CNs to synchronize the devices. Jitter amounts to about 20 nanoseconds. Cyclic isochronous data exchange takes place during the second period (“Cyclic Period”). Multiplexing allows for optimized bandwidth use in this phase. The third period marks the start of the asynchronous phase, which enables the transfer of large, non-time-critical data packets. Such data, e.g. user data or TCP/IP frames, is scattered between the asynchronous phases of several cycles. POWERLINK distinguishes between real-time and non-real-time domains. Since data transfer in the asynchronous period supports standard IP frames, routers separate data safely and transparently from the real-time domains. POWERLINK is very well suited to all sorts of automation applications including I/O, Motion Control, robotics tasks, PLC-to-PLC communication and visualization.